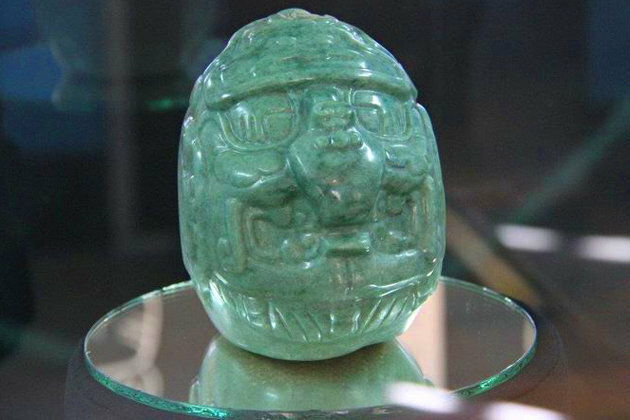 The infamous Jade Head of Belize, considered a national treasure. In Belize, folk stories abound, both as a means to share lessons, and a medium through which to share history. Folk stories come from a time when culture and history was primarily shared through oral traditions, and are best when they come in the form of the spoken word. Even today, at a time when literacy rates are high in Belize, and nearly everyone except some elders can read and write, folk stories are a means through which tales are told, and connections are made. One of my favorite folk stories in Belize was told to me while on a hike to some sacred caves outside of a small Maya village where I have done research and have a number of friends. Our party consisted of me, another researcher from Canada, and two Q'eqchi' Maya men in their early 30s, Timoteo, the son of a respected traditional healer, and Pablo, a partner of the local traditional healer's garden, who knew the trails through the bush with an intimacy lacking in the rest of us (the names are aliases). The day was perfect for a hike through the bush - sunny, but not too hot (for Belize anyway! ), which made the trails fairly dry, and the walk under the canopy pleasant. When we reached the caves, the stories began. For Maya peoples, both ancient and contemporary, caves are a sacred space. They are a connection to the underworld, the spirit world, and a place where the lines between the ordinary and the extraordinary begin to blur. When we reached the caves, both of our Maya friends slowed down, and expressed their uneasiness with entering. They half-laughed at each other, acknowledging their shared belief in what the Church tells them is just a superstition. After a brief prayer, they led us into the caves, where Pablo began telling us of the many artifacts that had been found there over the years, including ancient jars, skulls, and even the mystical, magical jade. Pablo's uncle had uncovered an intricately worked artifact carved out of jade just over the hills from where we were sitting at the cave mouth. Housed in a jade box with multiple moving parts, the artifact was like nothing he had seen before, and he thought he had hit the jackpot. He brought it home, and looked into selling it, as he was just a farmer with very little income. Word got out that he had this special jade carving, and after a couple of weeks, a group of three men arrived at his home to rob him. He snuck out the back of his house and hid with the artifact until the men left. After hiding for 3 days in the bush, he left the artifact hidden in the woods and returned to his house to be sure that the robbers had left. When he went back for the jade, however, it had dissappeared. Miffed at where the jade could be, the uncle decided to return to the spot where he found it. He had heard that sometimes jade can move on its own, and was often tied to certain places, so he decided to check it out. Sure enough, when he dug up the original spot again, there was the jade carving. Having brushed up with criminals who threatened his life because of the jade, this time the uncle let it stay where he felt it belonged. His story, however, didn't stop others from trying to find it, but as far as Pablo knew, that unique jade box still rested in that same spot. A few weeks later, I was visiting with an archaeologist friend who also works in southern Belize in a small rural Maya community, and I told her the story of the magically moving jade. She told me she had heard similar stories from a few of the villagers from where she worked. Jade, she was told, has a power of its own, and is known to return to spots from which it was taken. Still, despite its magic, jade is a prize sought by many Maya, who see it as a get-rich-quick scheme if they can find it in their fields or in one of the many caves that dot the region. Several hundred years ago, when this place was just a little village with thatched houses; one of the milperos, while working on his milpa, found a statuette in the bush. He carried it to Guatemala City and gave it to a Catholic priest who put it in the church there. To their astonishment, a couple of days afterwards, the statuette disappeared. The same fellow who brought the statuette to Guatemala City saw it at the exact spot where he had originally found it. He took it back to the church in the city. Again the statuette disappeared only to be found on the exact spot where it had been originally found. The same thing happened repeatedly until they decided to build a temple over the exact spot where it was found, and there proudly stands the temple up to this day for all to see. The temple became widely known for its healing powers, and every year on January 15th, pilgrims from throughout Guatemala, and neighboring countries descend on the temple to be healed and give thanks. This story too, appears to be rooted in Maya tradition, as several hundred years ago, it was likely a Maya farmer who is the main character in the story. It would also be my guess that the statuette was jade. And so we are left with stories that continue to be told today by multiple ethnic groups about the mysterious powers of jade artifacts. The stories come in many forms, but all hold that jade has some sort of ability to move, and that it is often rooted to a certain spot - a particular place in the landscape. It would appear that the stories are generations old, and may extend back to the ancient Maya and their apparent reverence for the striking green stone. Whatever the roots of these stories, they raise some interesting questions. Are these folk stories rooted in truth, and if so, what might that truth be? Can jade actually move through time and space? Or are these stories a means to communicate a message, or a lesson? What might that lesson be? Value what you have, or else it could disappear. Don't take things that don't belong to you. It sounds to me like a reminder that there are things in the world that we can not understand, and to use caution when we encounter them. I had given a jade to a friend. He wore it around his neck, and one day he realized it was gone. I found it in my pocket! Strangest thing I've ever witnessed!